The lyrics of Pete Seeger’s, Turn! Turn! Turn! are cribbed from Ecclesiastes and the pen of the wisest man who has ever lived. 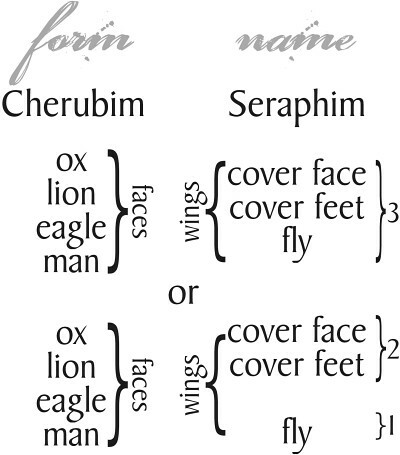 Solomon was aware of the duality of creation, and he charts a collection of them, which are found in the third chapter. 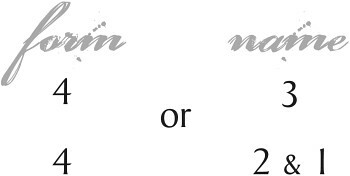 Again, it is my contention that this duality, this form & fill or form & name, is a critical part of an understanding necessary to enter into kingdom. In light of this, we are going to spend yet another post examining the two. 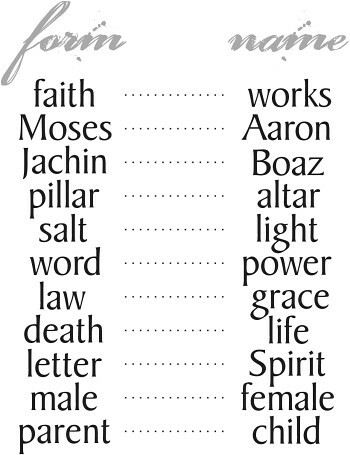 All biblical dualities are a braid of form and name. A look at this list shows you why faith without works is dead. Faith is the form, but works brings the power of life to the form created by faith. In Ezekiel’s valley of dry bones, faith creates the form, but works enable the breath that brings the form to life. The letter brings death, but the Spirit brings life. Form, given life by name. The Psalmist tells us that God has magnified, or elevated, his word above his name. Genesis tells us that the woman’s desire will be for her husband and he will rule over her. But don’t imagine that this is an eternal state of affairs. Death will not rule over life forever. In the Song of Solomon we read of the bride, I am my beloved’s, and his desire is for me. We are warned against having a form of Godliness, but denying the power. An overemphasis on the word creates a hollow form, a form that has no Spirit. Do not be one of these. 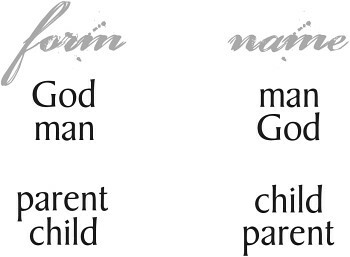 Remember that God forms and man names. Man places destiny within the forms that God constructs. Don’t spend an inordinate amount of time doing God’s job. The kingdom is not in word, but in power. The kingdom is not form, but name. That is why the kingdom is not what is seen. It is the unseen, the destiny within the form. This process is best seen in the rifts that cause denominations. That which was fill and brought life to many becomes form in its turn. That form is death unless it is filled with new Spirit. But those who have drunk of the old rarely change, so the new fractures off like a calving iceberg, to begin the cycle again; however, even the larger cycle eventually changes, with the form that enables the fill of denominations changing. So church itself becomes form and dies, and a new Spirit, a new destiny, must come along to fill this form. And so, the purpose of this blog. Nants ingonyama bagithi Baba, is more insightful than it may first seem in this circle of life. Folding is the secret of creation. As in all eternal things, there is a folding inherent in form and name. At some point in the process, that which was name becomes form and is filled with that which was form. We are found in God, but God also is found in us. The child carries on the name of the parent, but the parent is both genetically and culturally found in the child. Christ is the Word, but he says in John that he came to manifest the name of God. Again, beware of becoming confused – if your scene is shifting it means you are inadvertently altering your perception. Kingdom is not the end of all things. Rather, it is the next major cycle. As seen briefly in a drive by viewing in The Glory of Kings , it is the final act before a major folding. Beyond this major fold lies man creating form. 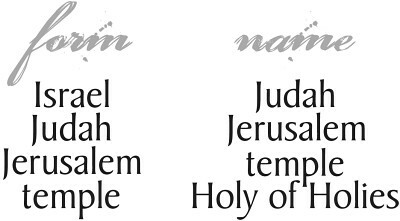 Form and name come out of the Pattern of Revelation. There aren’t many patterns, there is the pattern, the one. And all creation, all science, all history, all things conform to this pattern. Learn this, and the reality of kingdom begins to lay bare before you.